Star Warz keeps profiling itself as one of the finest Drum ‘n’ Bass concepts the world has ever seen. Star Warz has been visited by almost all leading and rising artists & labels in the scene and it is one of the partners of Tomorrowland since day one. We are just recovering from two absolutely mind-blowing days at 10 years Tomorrowland where we hosted a ‘20 Years of Metalheadz’ stage with artists such as Goldie, Ed Rush & Optical, Dillinja, Sub Focus and many more. And to name just a couple of our other extra ordinary editions; All Metalheadz nights, 20 Years Of Ram records, 15 Years of Virus Recordings & Soul:ution, 10 Years of Exit Records, 10 Years of Shogun Audio and the list goes on. Each of them are memorable nights that will go down in the history books of Drum’n’bass. And now Star Warz is hosting a Critical Music night. Conceived by Drum ‘n’ Bass visionary Kasra back in 2002, in a front room in north London, the Critical Music name has since blossomed into one of the most successful independent record labels in the UK today. Grown from a simple idea driven by a commitment to putting out the best music the scene has to offer, it has now become one of the most well respected electronic dance music labels in the UK. Nurturing new talent and releasing some of the freshest breaks and beats from the likes of Enei, Foreign Concept, Break, Rockwell, Sabre, Stray, Cyantific, Marcus Intalex, S.P.Y, Calibre, Total Science and many more, it has gone on to build a loyal following around the world driven on by Kasra’s never ending quest to release quality underground bass music. Ever-evolving, the label has recently substantiated itself even more so with the exclusive signing of two of the world’s most talented producers, Russia’s Enei and Brighton’s Foreign Concept, each having proved themselves to be two of the shining lights of the new generation of Drum ‘n’ Bass artists. Not only a record label, the Critical empire also boasts its own highly esteemed club nights with a residency at London’s world-renowned Fabric club, as well as regular branded Critical tour nights across the UK and abroad. Drawing in familiar faces from the world of Drum ‘n’ Bass you can be sure each and every Critical event is programmed to perfection, with leagues of fans attending each one in abundance. In 2012 they celebrated 10 bass-fuelled, ear-pleasing years of Critical Music with a string of label nights around the world of which one on Star Warz. That same year Kasra’s Fabric Live 62 mix album hit the shelves to rapturous applause and the label nights continued to prosper. So now, 2014 seems to be the tipping point for Kasra both as a DJ and a label head of one of the most inspiring imprints in dance music today. The Critical age is only just beginning and we’re more than happy to have them back! 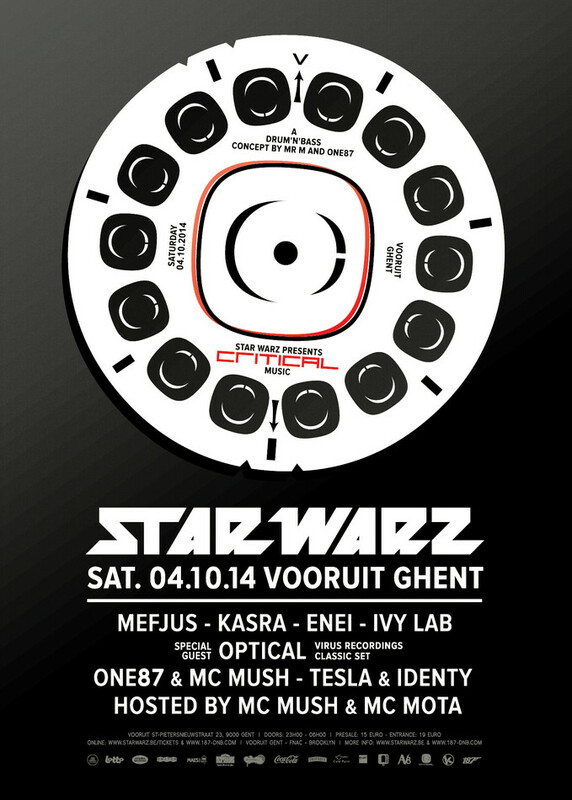 Especially as Kasra is bringing a bunch of the finest talents on his label to Ghent. With a lot of great releases he already had on Bad Taste, Disturbed, Trust in Music, Citrus, Tilt, Mindtech, Ammunition Recordings & Neosignal, Kasra secured Mefjus as a fully fledged member of the Critical Music squad in 2012. First with a collaboration between Mefjus & Enei, followed by one of the label-boss & Mefjus last year. These were followed by two solo productions: ‘The Contemporary’ and ‘Hello World’ EP’s. Mefjus is now also a regular guest at Critical events all over the world and we’re happy he will be joining them on this one too! Russia’s number 1 producer/DJ, Enei, released his debut album, Machines, on Critical in 2012. With his music supported by Goldie, London Elektricity, Bailey, DJ Hype, Andy C, Kasra and many more, and an ever increasing DJ’ing schedule, you can guarantee this is one of the most exciting new producers in electronic music today and he continues to make his way. Check his other productions on Critical, including collaborations with Foreign Concept, Spectrasoul & again, the latest, Kasra himself. Enei, Critical Music, standard! Ivy Lab was born in 2011 as a meeting of the minds of Sabre, Stray and Halogenix. Initially starting off as 3 mates making beats, what was realized fairly early on was that there was potential for a lot more. ‘Oblique’ firmly set the path for the cementing of the coalition and attracted the support of some of the highest celebrated labels and DJs of the moment. And there’s more, because next to these 4 heavy weights from Critical, no one less than Optical will be joining this new Star Warz adventure. Optical, Ed Rush’ partner in Virus Recordings, will be bringing an exclusive classic Virus set. Prepare to be launched back in time by one of the greatest artists around! And also resident One87 has been producing for Critical and he will be supporting his label-mates in that special way that only he can, backed up by Belgium ‘s finest MC Mush. More MC power comes from MC Mota and the new talent is represented by Tesla and Identy. Star Warz at its best, as usual !